The species and subspecies of plants collectively known as African violets belong to one of the smaller groups in the Old World Gesneriaceae. Wild populations are found chiefly in the area known as the Eastern Arc Mountains of Tanzania and Kenya. The plants grow on moss-covered boulders, on cliffs or on rock outcrops shaded by large trees. While the natural growing area is well within tropical Africa and not far from the equator, most species grow at middle altitudes with cooler temperatures, and some at higher altitudes with seasonally chilly weather. The natural growing locations of these plants are extremely small in area. Many African violets face extinction due to habitat destruction from farming and logging of the canopy trees. The majority of the species and subspecies are listed as vulnerable, endangered, or critically endangered. African violets have long been known to be closely related to other African Gesneriad genera, especially to subgenus Streptocarpella within the genus Streptocarpus. Recent studies have confirmed the closeness of the relationship and botanists have “sunk” the former genus name of Saintpaulia within this group. Therefore, all the species and cultivars we have known as Saintpaulia are now properly Streptocarpus and will generally be referred to as such within the GRW. 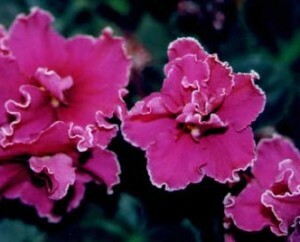 The exception is for African violet hybrids, the focus of intense commercial and hobbyist activity for many decades. Referring to these cultivars as Streptocarpus is potentially confusing, as several of the same names used for cultivars in the Saintpaulia group have also been used for cultivars in Streptocarpus subgenera Streptocarpus and Streptocarpella. In addition, the term “Saintpaulia” has been widely used for many years in both hobbyist and commercial contexts. The GRW will therefore refer to hybrids within Streptocarpus subgenus Streptocarpella section Saintpaulia as simply Saintpaulia, unitalicized as it is no longer a proper genus name. Readers should understand, though, that these hybrids are within the genus Streptocarpus. A full discussion of African violets can be found in the article “Saintpaulia: The African Violet” by Jeff Smith. The article describes in detail the recent taxonomic changes of these plants. Something to watch for is that many of the former “species” have been reduced to “subspecies” (abbreviated as ssp.) and plants descended asexually from one individual are often identified as “clones” (abbreviated as cl.). African Violets mutate readily and hybridization programs over the last 80 years have exploited these mutations to produce thousands of brightly colored cultivars in a variety of sizes and forms. Because most African violets thrive in the same temperature and lighting conditions found in homes, they are one of the most important houseplants in the horticultural industry.